This part of the program contains the actual Office document and is the one you should concentrate on if you're interested mainly in how a partnership between Office and eBay can exist. 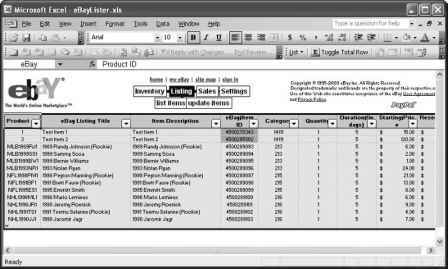 Open eBayLister.xls and you'll see an opening page named Settings with the same information requirements as every other example in the book. Depending on how you configure Office, you might also see a macro warning; you can dismiss it to use the application. You must provide your eBay keys, as well as a valid username and password. Once you enter information on the Settings page, you're ready to go. Simply click Verify to ensure the settings will work. The remaining three items in this spreadsheet let you work with items on eBay without ever leaving the Excel environment. The pages are listed in the order that you'd normally use them, starting with the Inventory page show in Figure 7.4. As you can see, this page contains a list of items to sell on eBay. You can add, remove, or modify items as needed. 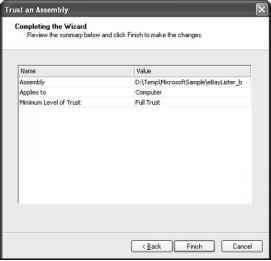 Verify the security settings before you complete the wizard. The Inventory page contains the items that you want to sell on eBay. The most important column on the Inventory page is the List on eBay column. You must change this column to "y" (for yes) for every item you want to list. The Listing page shown in Figure 7.5 comes next. You use this page to list new items and to check the status of current listings. This page doesn't tell you about sales, but it does keep track of your listings. The page even tells you the current high bid and the identity of the high bidder. You can also check on issues like the BuyltNow price and the number of days the auction has left to run. Keep track of your current listings using this page. The final page is Sales. This page tells you which items have actually sold. 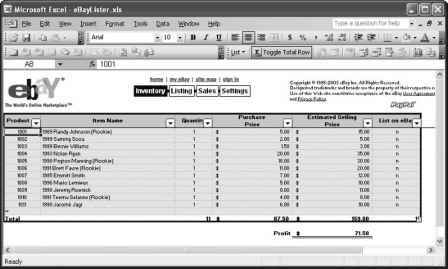 In addition, it combines features of eBay Web Services with Excel to determine information such as the gross profit for the item and whether you have sent an invoice to the buyer. Although this isn't the most complex example of working with eBay, the fact that it combines so many new technologies to produce this unique result makes it extremely interesting. This example shows how you can build an add-on for Excel using Visual Studio .NET that makes eBay access almost trivial. It's the type of example you'd want to study if you needed to build a simple application for a lot of users in a corporate setting. 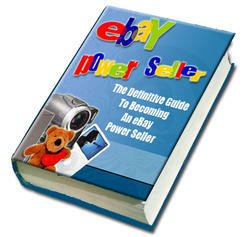 The Definitive Guide to Becoming an eBay Powerseller guides you through the rules, giving lists of prohibited items, behaviors, and other landmines.